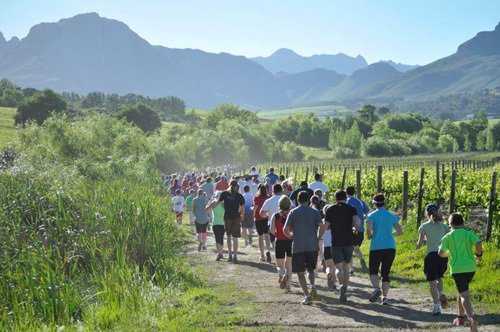 In this edition of the SA parkrun newsletter we welcome a new event in the Pretoria area while Mpumalanga celebrates their newest addition this coming weekend. Lady Legends of the road are spotted at parkruns across Jo’burg. With the festive season approaching there has been no let up at parkrun SA as we celebrate launching a new parkrun and anticipate a few more in the coming weeks. 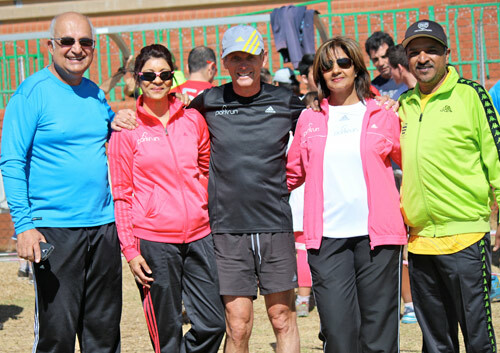 Last Saturday Seena Azmuth and Amina Mohamed started a parkrun in Laudium in Pretoria West. Pretoria has been desperate for a second parkrun to support the very popular Voortrekker Monument parkrun. Voortrekker parkrunner, Anita Blount (See photo) chose to join the 50 club at the first Laudium run. The Roodepoort Raiders were there in force to support the parkrun they declared the Laudium parkrun to be a tough hilly two lapper which is lots of fun. 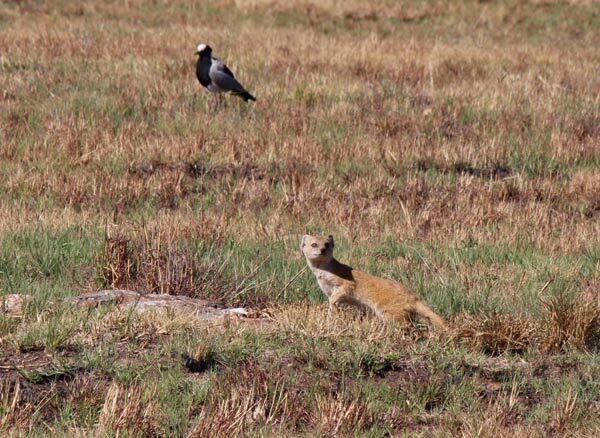 We even spotted some interesting wildlife while running. (See photo) It was good to see youngsters playing cricket and making use of the other sports fields at Laudium. 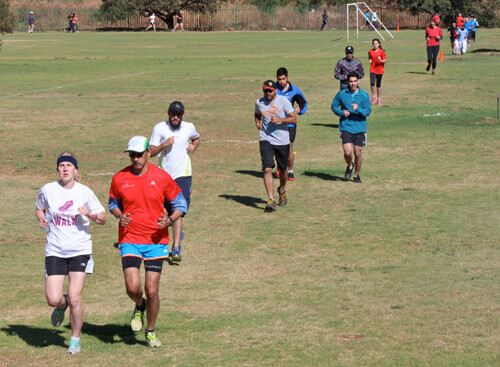 The parkrun will be a very popular addition to the sporting activities that take place on the Laudium fields. Thanks must go to the Laudium community and council for their enthusiastic support. This Saturday will see the start of the Secunda parkrun in Mpumalanga. Gill and I travelled to Secunda to help Bruna dos Santos, Dean Moore and Adele Enslin with their dress rehearsal run and to give some last minute tips and advice. 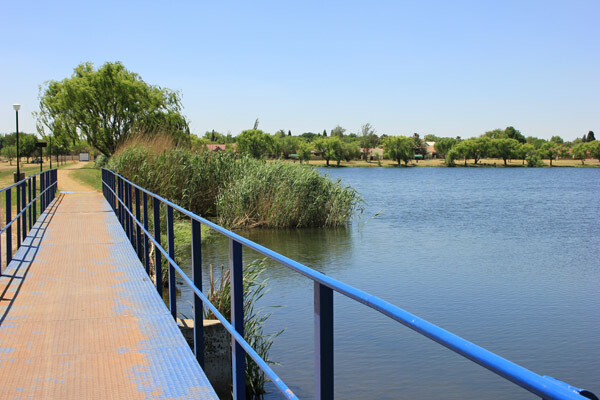 We were bowled over by the beautiful tranquil park (The Trichardspruit dam) through which the parkrun will be run. Not only is it a lovely park but it is also fast and flattish and will produce some really fast times for the speedsters while being an enjoyable scenic walk for slower parkrunners. 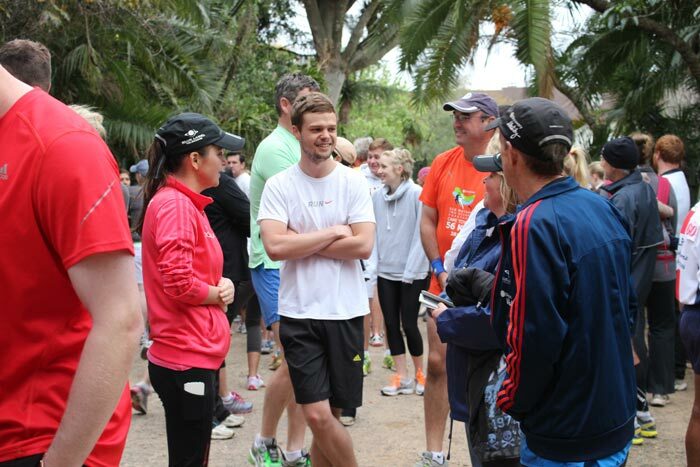 Speaking of speedsters parkrun SA has had its fair share of fast runners running well in the last few weeks. 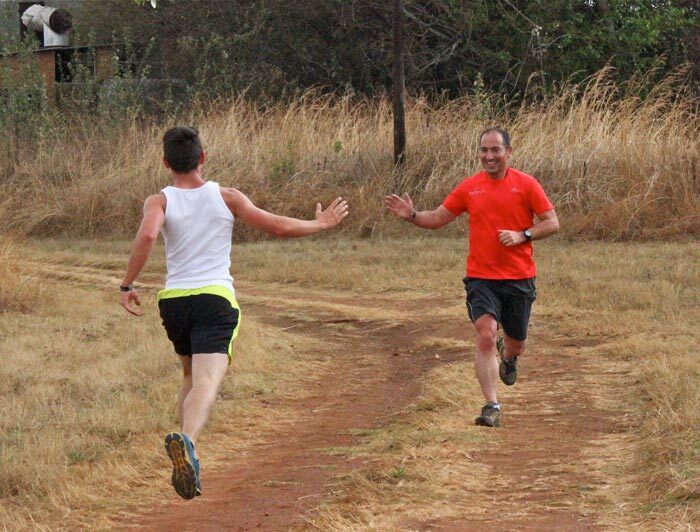 Ebotse parkrun welcomes Frith van der Merwe on a regular basis. 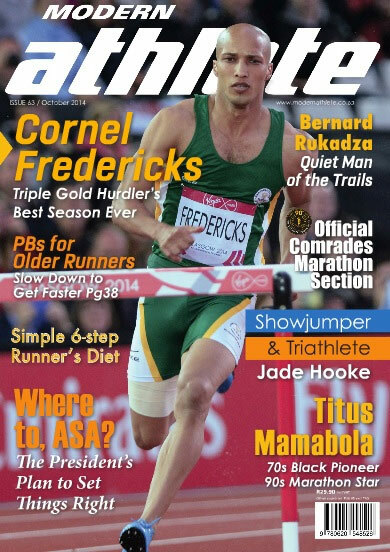 Frith is a triple Comrades marathon champion and still holds the ladies record (1989) for the fastest Comrades of all time. Rene Kalmer recently broke 2:30 at the Berlin marathon and is now the course record holder at Delta Park parkrun. Incidentally Rene displaced Zola Budd as record holder at Delta. Finally Folavia Sehohle who ran an incredible 14:35 at Halls parkrun was invited to be an official pacemaker at the Amsterdam marathon. Congratulations Folavia. Of course parkrun is for runners and walkers of all abilities and we wish you a happy parkrunning fortnight until our next newsletter. Herzogenaurach, Germany (Sept. 29, 2014) - adidas’ Dennis Kimetto ran the fastest marathon in history wearing adidas BOOST™ at the 2014 Berlin Marathon. 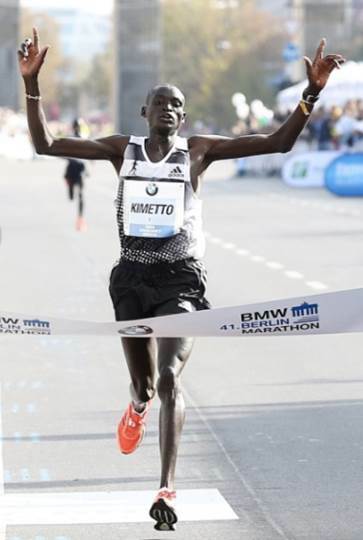 With a time of 2:02:57 Kimetto shattered the previous world record by an astounding 26 seconds wearing the super lightweight adizero Adios BOOST. Summer is almost here! Remember – it’s important to be sun safe. We have a few tips that you can make a part of your routine as we head into the warmer weather. The October edition of our Media Partner, Modern Athlete Magazine is available online now! Subscribe to Modern Athlete here. 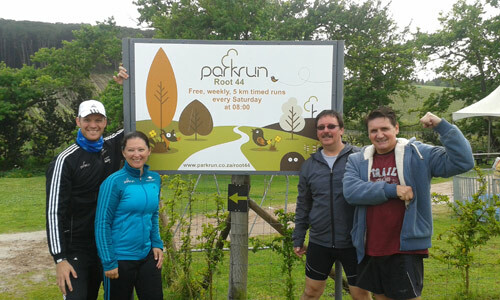 Root 44 parkrun and its parkrunners have had a busy few events! Since International parkrun Day all our parkrunners have been emerging from their winter hibernation! We unveiled our awesome new sign! Thanks to loyal parkrunner and volunteer stalwart Kobus Toua who produced and donated it. Marais Olivier from the BadgeCo did the artwork. 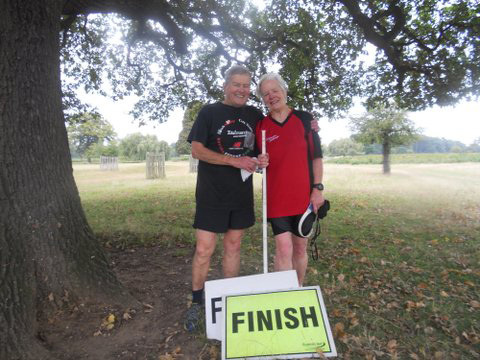 Everyone’s favourite pair of Reids, Janet and Geoff, have moved to Torrens parkrun (Aus). Alison de Jongh visited the quaint Blanford Forum parkrun (UK) and Janet and Rob Lanning flew the South African colours at Bushy parkrun (UK). The Lannings even made it into the UK newsletter. Root 44 parkrun smashed through the last attendance record last Saturday with 723 smiling parkrunners! What an amazing vibe and seeing a worm of colour winding its way through the vines was stunning! Thank you to all the volunteers, you are all super stars! 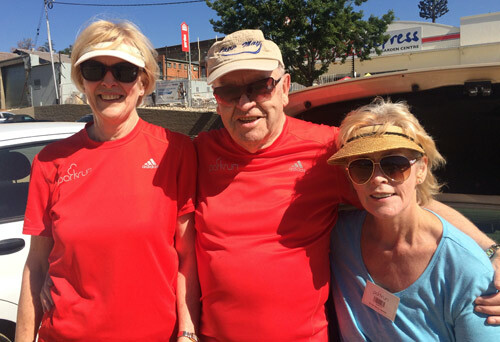 On Sat 18 October, I participated in our parkrun at Bryanston and met up with a couple who completed their milestones of 80 and 71st parkruns….and their friend was doing her 77th. I felt this was quite a milestone!! adidas, the official technical partner to parkrun South Africa, will be joining the Delta Park (Johannesburg) and Green Point (Cape Town) runs on the 25th of October to promote the latest editions of adidas’ ground-breaking running shoe, Energy Boost. In August, adidas hosted special Women's Day activations at two of the parkrun sites, treating all female runners to a free coffee and healthy breakfast treats after their run and this time, it promises to be even bigger and better. Healthy snacks and drinks will be available to all this time around, music will be provided to help you over the line, the adivans and Adidas tech reps will be on-site to showcase their latest running rangesand to offer the runner an opportunity to test the shoes. Fantastic adidas prize hampers will be up for grabs , for some surprise activations to push you to go the extra mile as well as an ultimate opportunity to win an entry to the two oceans marathon 2015! The newest model of the iconic Energy Boost range provides an improved fit as well as a bold look and feel to help runners embrace the road with confidence and style. Two colorways each for men and women are available at adidas Performance stores and other major retailers. In this edition on the parkrun newsletter, parkruns across the world celebrate the 10th year of parkrun. We hear how parkrun and the International Association of Athletics Federations are partnering to make a difference in many lives. Don’t forget to catch Modern Athlete’s digi-mag and look out for adidas at your local parkrun during October! This must have been one of the most momentous weeks in the history of parkrun (Apart from the birth of parkrun itself in 2004). This week we celebrated a decade of parkrunning and marvelled at the incredible growth of parkrun during the last 10 years. How fitting that parkrun founder, Paul Sinton-Hewitt received his C.B.E. this week. Here in South Africa our parkruns celebrated the 10th birthday in a variety of ways, with colourful outfits, birthday cake, balloons and even the odd parkrun run in reverse! It is exciting to consider that here in South Africa we will only turn 3 in November and already nearly 140000 parkrunners have registered with us. 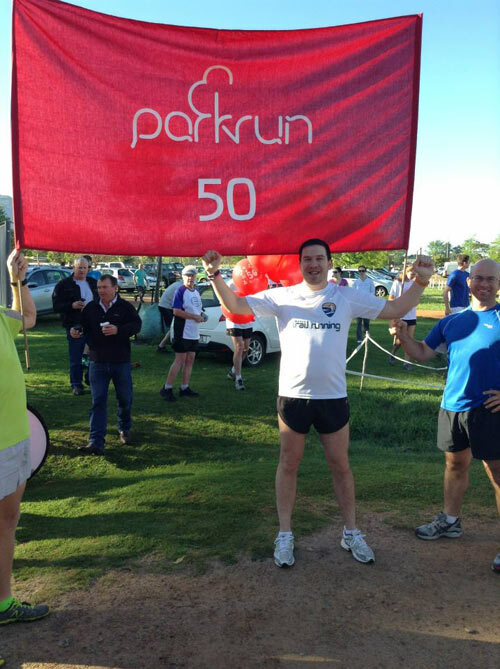 In South Africa 11310 parkrunners celebrated the birthday and 80169 in total Worldwide! The volunteer team at Mashishing (Lydenburg) parkrun will never forget their birthday as it coincides with International parkrun day. A small but very enthusiastic group of parkrunners celebrated International parkrun day by running their inaugural parkrun in the Fisheries grounds in Mashishing . There can’t be too many parkruns that are run past trout dams, a large herd of cattle and some Blesbok for good measure. The Saturday before International parkrun day the Grahamstown community started their parkrun in the Botanical Gardens of this city famous for its educational institutions. Congratulations to Nicola Brown and her team for their efforts. 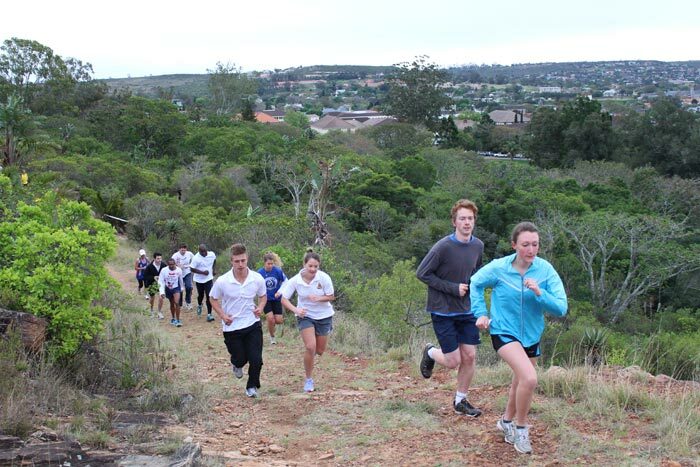 The Grahamstown parkrun includes a steep hill that has to be climbed twice. Thank goodness for the hill because it served as a barrier to allow this writer to just scrape home ahead of his son Jonathan Fordyce!! 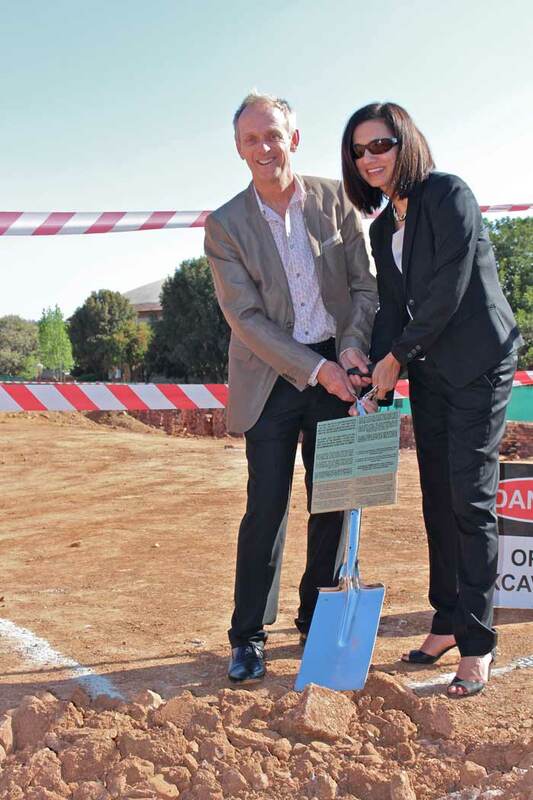 A proud moment in my life this week was to be asked to turn the first sod of the University of Pretoria Athletics Foundation Trust building. This honour I shared with the Tukkies Vice Chancellor Prof Cheryl de la Rey. The aim of the Trust is to fund the building of an athletics school which will hopefully produce well educated athletics champions in the future. I am delighted to report that a few of the first intake of students are parkrunners and they have been running some frightening times at our parkruns. parkrun announces that it has joined forces with the International Association of Athletics Federations (IAAF) to become a Partner of Athletics for a Better World. Each week parkrun introduces more venues across the globe where people can take part in a free, fun filled, 5 Km run. In so doing, we are delivering social change in all the countries that we operate in. As an example, last week we witnessed over 80,000 people enjoying a walk, jog or run at one of our friendly events which is only made possible because of the commitment and generosity of our 90,000 volunteers. This weekends events were brought to you by over 6,300 of our wonderful volunteers. With over 1.2 million people registered and growing by over 14,000 new members each week, parkrun’s welcoming attitude and community focus makes it an ideal place for social change to take place. Each week we celebrate everyones achievements at each of our +500 locations. By introducing this partnership, the IAAF and parkrun accept that we have a global responsibility to use the power and reach of athletics to make a positive difference in peoples lives. In Johannesburg and Cape Town on the 25th there will be some great give-aways and prizes including hampers, vouchers, and a lucky draw entry into the Two Oceans marathon. Getting to Gold Vitality status has never been this easy. Vitality members can now earn up to 11 000 Vitality points with the new Vitality Nutrition Consultations, a more comprehensive approach to nutrition coaching that has replaced the Vitality Nutrition Assessment.